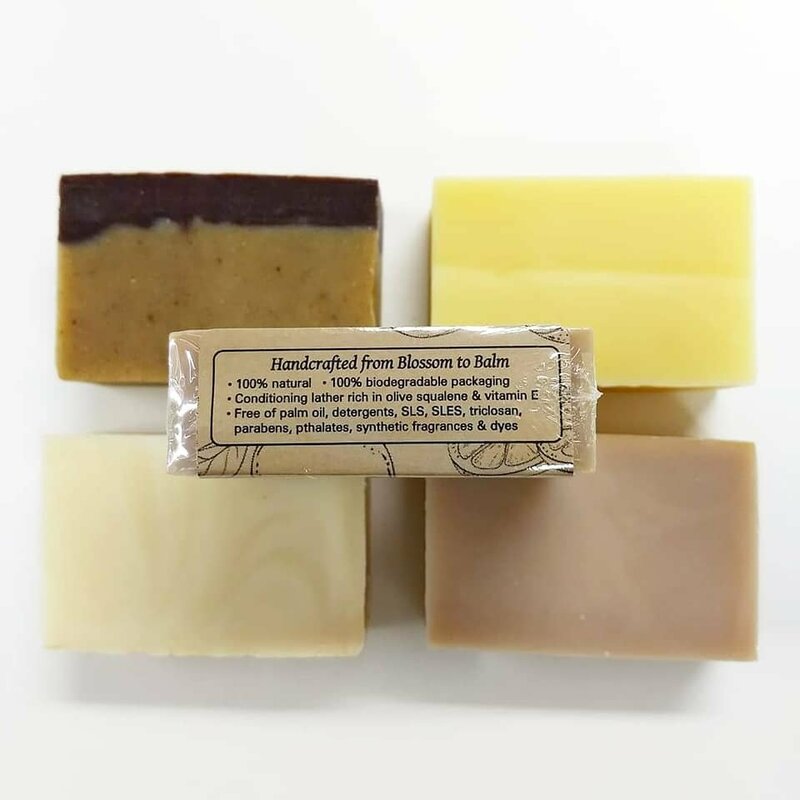 All of our 100% natural bar soaps are free of palm oil, handmade in small batches with lots of shea butter, and scented with pure essential oils and extracts. Gentle enough for faces, cleansing enough for hardworking hands and dirty hair. No detergents, SLS, SLES, triclosan, parabens, pthalates, synthetic fragrances, or dyes. Packaging is 100% biodegradable including outer film wrapping. 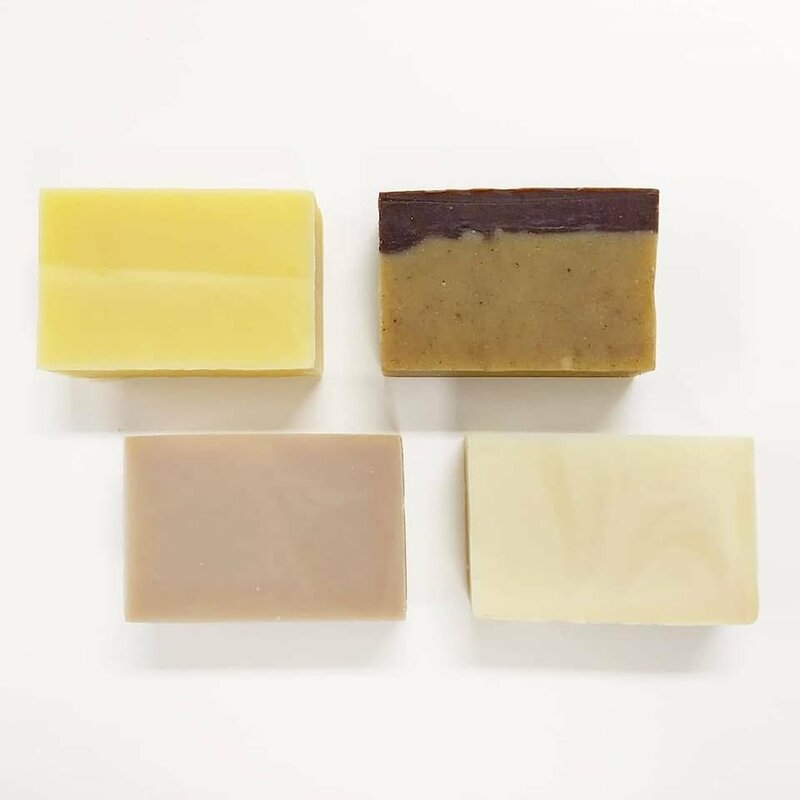 Try any of our bars as shampoo bars: wet hair, rub the bar directly on your hair from roots to ends, or create lather in your hands and apply to hair. Work lather through hair and scalp, rinse. Follow with a diluted vinegar rinse to restore your hair's pH: approximately 1 tablespoon apple cider vinegar to 1 cup water. For longer hair that tangles easily, use up to 4 tablespoons apple cider vinegar to 1 cup water. 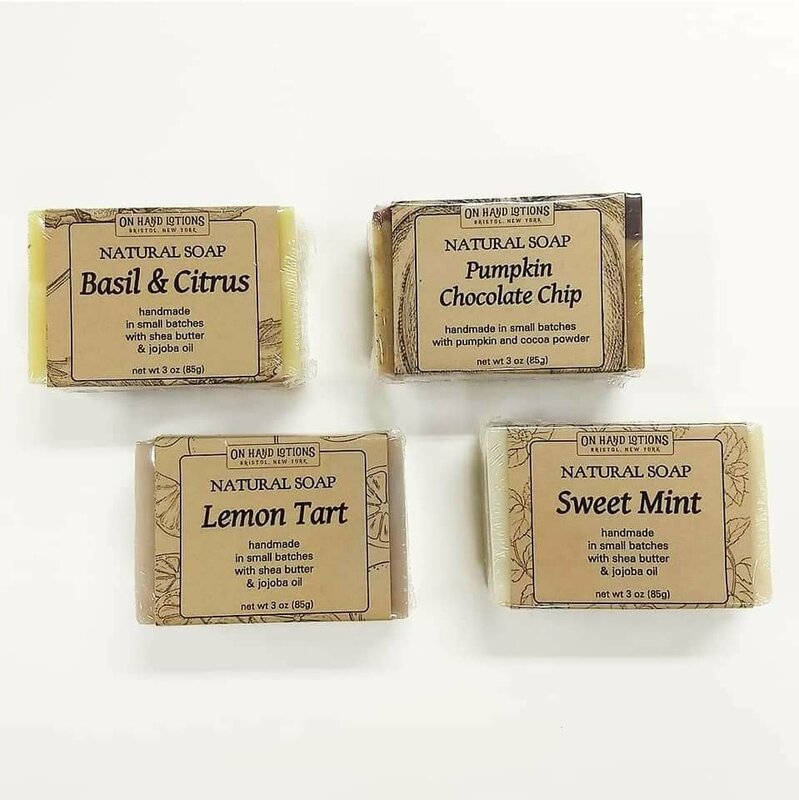 Also available bare: no wrapping, no label, just the soap. 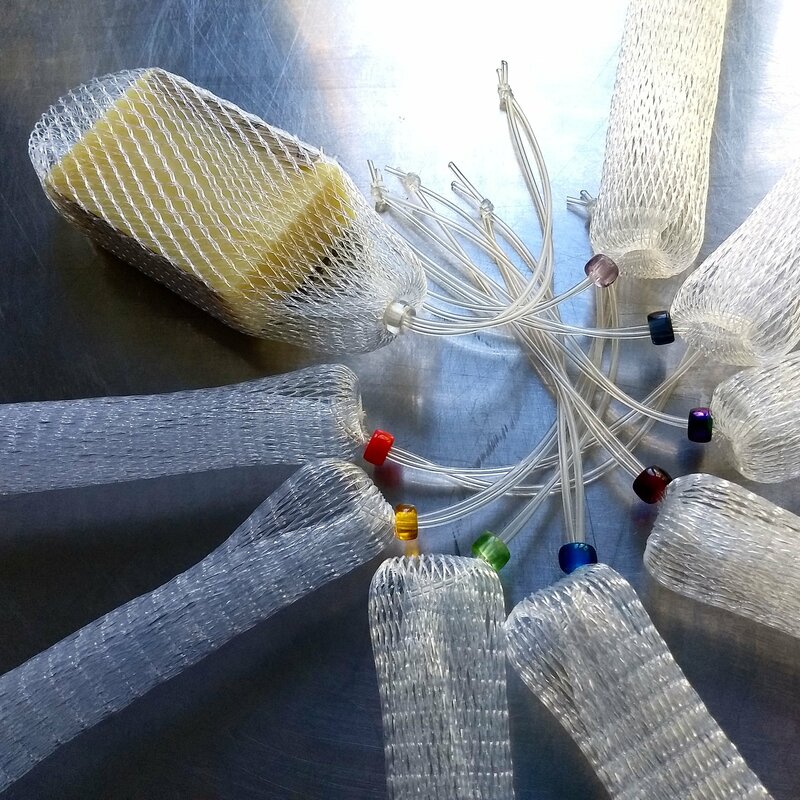 Add a soap loofah bag: simple, straightforward, maximum suds. Made from recycled bottles, this hanging soap bag prolongs the life of your bar by allowing it to hang dry completely between uses. Net weight 3 oz (85g). 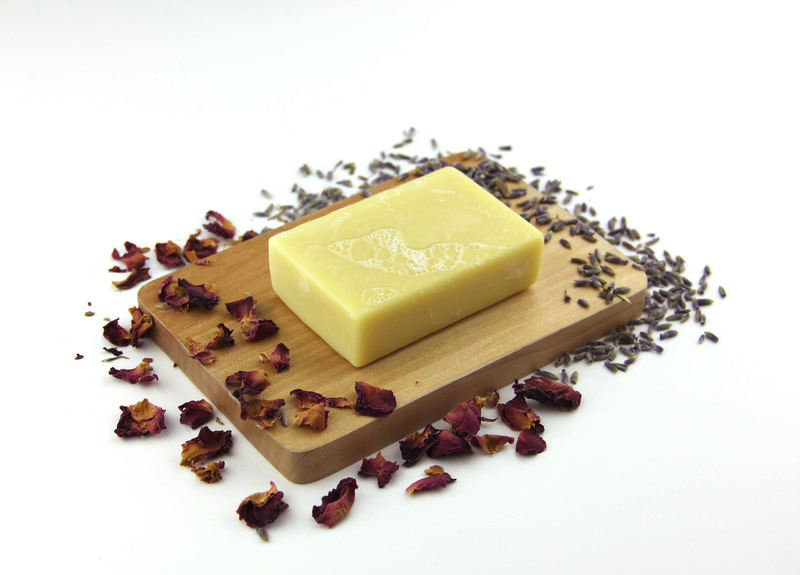 Please note that our cold process soap will become harder and milder with age, and is also safe and gentle to use now. For a longer lasting bar, store on a draining soap dish or hang in a mesh soap keeper out of the shower's direct spray. Pairs beautifully with a solid lotion bar and body scrub for a thoughtful custom gift. VEGAN SOAP: Conditioning, gentle, nourishing lather rich in olive squalene and vitamin E. This luxurious formula features golden jojoba oil. Ingredients: Saponified Oils of Olive, Coconut, and Rice Bran, Water, Shea Butter, Jojoba Oil. May contain essential oils. Unscented: Truly scent free. This is the best choice for babies and also for folks who are sensitive to scents. Gentle as body wash and shampoo bar. 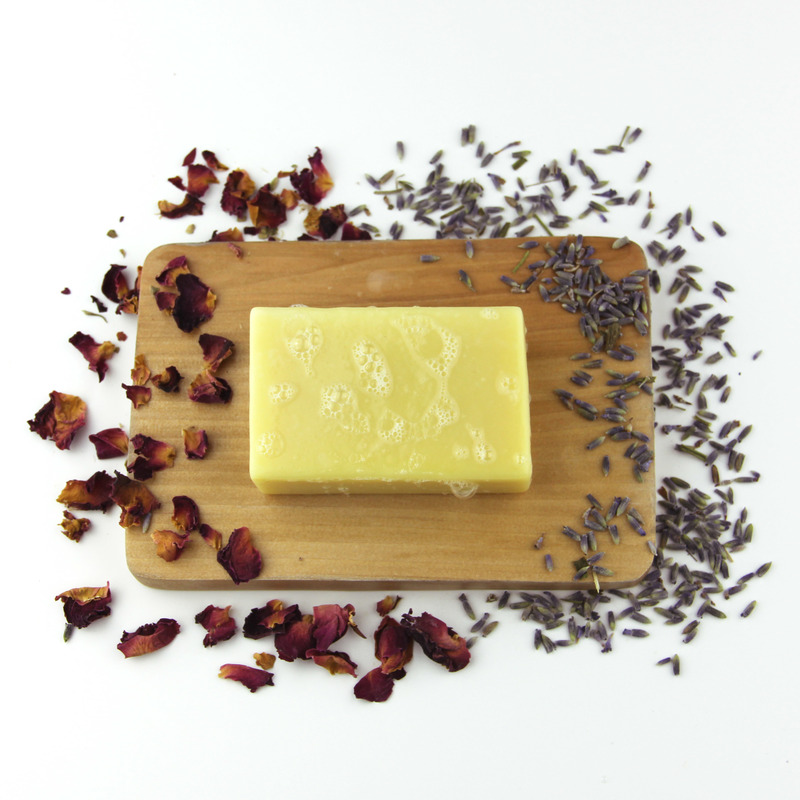 Lavender: Clean, soothing lavender essential oil transforms our shea butter bar into a relaxing spa experience. Excellent body wash and shampoo bar. Lemongrass: Bright, uplifting lemongrass essential oil. Brilliant citrus and green leaves create a fresh invigorating scent. Excellent body wash and shampoo bar for normal to oily hair. Basil & Citrus: Clean green basil with sweet orange and anisette notes, blended together in a sunny yellow layered bar. Makes a wonderful kitchen hand soap, body wash, and shampoo bar for normal to oily hair. Lemon Tart: Light lemon zest and sweet natural vanilla, like lemon meringue pie. Medium tan bar with subtle swirls. Soft scent pairs perfectly with our lemon tart lotion bars and lip balms. Mild body wash and shampoo bar. Pumpkin Chocolate Chip: Fresh pumpkin and warm spices layered with dark cocoa in a beautiful two-tone, spice-speckled bar. Soft pumpkin scent with delicate chocolate notes. Excellent gentle body wash. If using as shampoo bar, best suited to dry to normal hair. 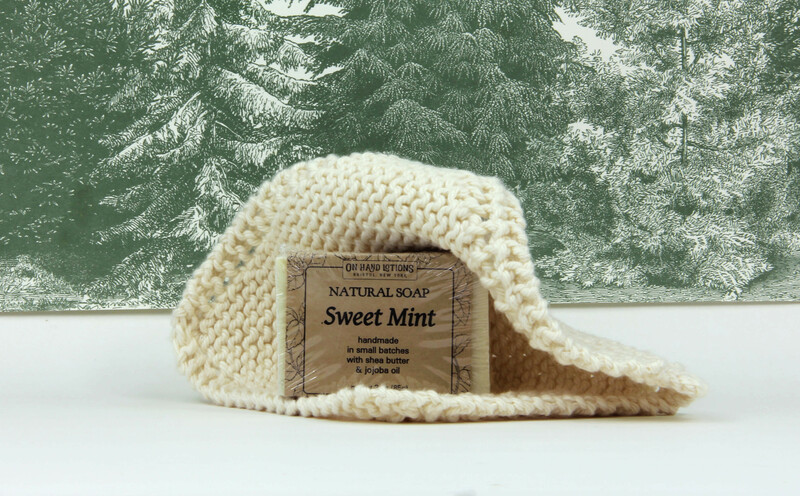 Sweet Mint: A cool blend of spearmint and peppermint, this clean-smelling soap is fresh and herbal and a fun upgrade to the standard candy cane fragrance. Light tan bar with subtle swirls. Great body wash and clarifying shampoo bar. NEW! Bristol Woods: woodsy, earthy, clean. Pine, balsam, cedar, vetiver. Luxurious green clay nurtures skin and hair, white pine infusion adds brightness, just-tapped maple water adds light sweet notes and a lather boost. Earthy, clarifying body wash and shampoo. Coordinates well with Vetiver & Geranium or Lemon Drop body scrubs, Patchouli & Cedar or Be Set Free solid lotions, and Original Scent Beard Balm. NEW! Flower City Lilac: this is all floral! Sweet, natural lilac scent created in-house using the scent preservation method of enfleurage. Floral notes of lily of the valley and jasmine. Floral and gentle as a body wash and shampoo. Pairs beautifully with Flower City Lilac premium body scrub and Lavender solid lotion. Named after Rochester, New York: the Flower City. Logo used with permission of the City of Rochester. NEW! Four Spices: warming and spicy with cinnamon, clove, rosemary, paprika, and a bit of fresh citrus. Rich body wash and shampoo. Layer with Chai Spice body scrub and Four Spices solid lotion. EGG YOLK SOAP: Conditioning, gentle lather rich in olive squalene, collagen, vitamins A, D, and E. This formula is enriched with egg yolks from our pasture-raised chickens and creates a unique, lovely soap that is at once cleansing and nourishing. Ingredients: Saponified Oils of Olive, Coconut, and Rice Bran, Water, Shea Butter, Egg Yolks. May contain essential oils. Winter Orange: Sweet orange and warm spices reminiscent of a cozy afternoon tea. Wonderful body wash and great shampoo bar for dry hair.